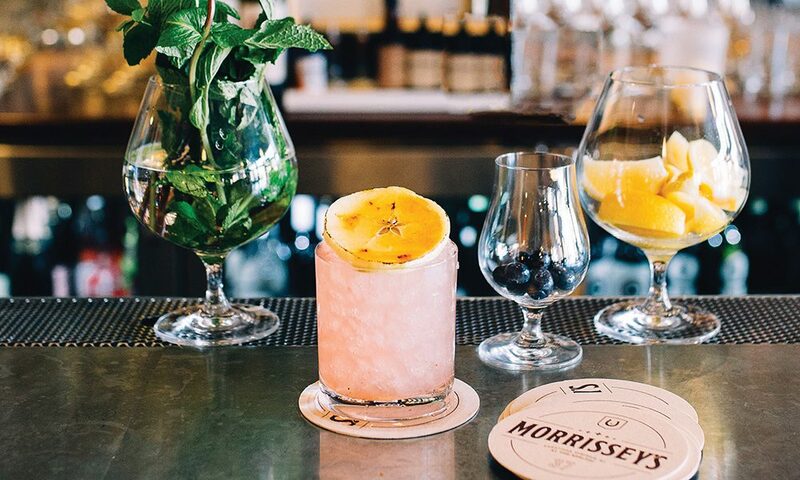 Will The Next Great Saratoga Cocktail Be Morrissey’s At The Adelphi’s ‘Saratoga Smash’? The classic hotel bar throws its hat in the ring with what it believes to be the next great Saratoga cocktail. In saratoga living‘s “I Do!” Issue, local bar Hamlet & Ghost offered up the “Saratoga Sunset,” what it believed to be the next great Saratoga cocktail. Now, they have a little bit of competition. Paul “Bouch” Boucher, bartender at Morrissey’s at The Adelphi Hotel, ginned up the “Saratoga Smash,” a smashing take on a classic whiskey-based cocktail. Find out more about it below—and how to make it in the comfort of your own Saratoga home. I’m calling our Saratoga cocktail entry the “Saratoga Smash,” basing it on the classic Whiskey Smash. The “Smash” has been around for more than a century, and fits well in a drinking town with a horse problem. I decided to use an Irish whiskey aged in American rye barrels to honor our bar’s namesake, John Morrissey, who was Irish-American. I chose the blueberries, because in my mind, it shouts, “Summer!” from the rooftops. Apples are obvious; we live in New York State, one of the leading producers of nature’s OG fruit. Mix that all together, and you’ll instantly become a magician, making cocktails disappear in the blink of an eye. Muddle lemon, blueberry and mint. Add whiskey and syrup and shake with two ice cubes. Strain over crushed ice and garnish with a caramelized apple slice.